I consider myself expert in biological effects of cell phone radiation. I have two doctorates and docentship in biochemistry. I worked at STUK for nearly 22 years, including as Head of Radiation Biology Laboratory and most recently, for 13 years, as Research Professor. I do research on cell phone radiation and health since 1996. My expertise in this area was recognized by my peers when e.g. I was invited to testify before a committee of the US Senate, Finland’s Eduskunta, Canadian Parliament or Health Minister of India. I was member of the group of 30 scientists who, at invitation of IARC, classified in 2011 cell phone radiation as a possible human carcinogen (group 2B in IARC scale). For those interested my full experience is available from this link. I read carefully recent interview with Professor Tapio Ala-Nissilä published in ‘Voi hyvin‘ journal and in ‘Turun sanomat’ newspaper and I got very confused. 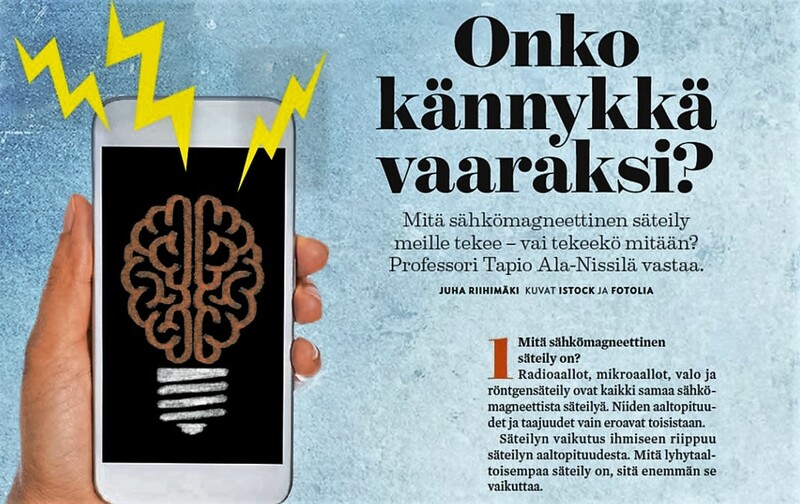 Professor of physics at the Aalto University in Helsinki is serving very strong, partly false and misleading, one-sided opinions on biological effects of cell phone radiation. The interview with Ala-Nissilä is full of false statements, misleading claims and omission of evidence disagreeing with the views of Ala-Nissilä. There are several hundreds of studies showing biological effect of radiation emitted by cell phones. To claim that all these studies are false it is to claim that all scientists who made them are incompetent – I think there is no any basis for such claim. Some of the studies showing biological effects were replicated (e.g. effects on brain electric activity, on sleep, on cellular stress response, on blood-brain barier, on increasing glioma risk), some of them were not. The problem with replications is that scientists always improve the original set up of experiments and, in the end, the new study is not really replication the original one. This might cause differences in outcomes. Also, a large number of studies showing effects were, for unknown reasons, never attempted to be replicated. Some of the observed effects are clearly non-thermal, caused by something else but the heating of the tissues exposed to cell phone radiation (e.g. effects on brain electric activity, on sleep, on cellular stress response, on blood-brain barier, on increasing glioma risk). As physicist, Professor Tapio Ala-Nissilä should know that, what he calls microwaves emitted by humans, are very different from microwaves emitted by cell phones. So, being physically close with another person is completely different from having a cell phone close to the body. The difference is in frequency and in modulation of the microwaves emitted by cell phone. It is Ala-Nissilä’s misleading claim that only small temperature increase happens and it does not matter. Saying that human body heat and radio-frequency modulated microwaves emitted by cell phone ate the same is absolutely wrong. It is as if saying that cows and horses are the same because all have four legs. Classification of cell phone radiation as possible carcinogen was predominantly based on epidemiological studies and had supporting evidence from animal studies, especially studies where animals were co-exposed to cell phone radiation and to another chemical or physical agent. Tapio Ala-Nissilä falsely claims that these studies were repealed by newer studies, published after 2011 IARC classification. Results of epidemiological studies from Interphone group and from Lennart Hardell group, showing small but increased glioma risk were re-confirmed by recent Cerenat group study from France. Animal studies showing increased risk of cancer in animals exposed simultaneously to cell phone radiation and other carcinogens were re-confirmed in recent study from Alexander Lerchl in Germany. Claim by Tapio Ala-Nissilä that the classification will be reversed in next meeting of IARC is absolutely baseless at this point. It sounds as, completely baseless, “wishful thinking”. Furthermore, looking at cancer statistics in different countries it is evident that glioma prevalence is on small but steady increase. To what extent it is caused by cell phone radiation – we do not know yet because epidemiology cannot be used to conclusively demonstrate it. Tapio Ala-Nissilä is also out of date on cancer classification of coffee. It was recently re-classified by IARC from the possible carcinogen group (group 2B) to the non-classifiable group (group 3) because the new science has shown that it is not the coffee that causes throat cancer. It is the habit of drinking scalding hot coffee or mate, in some parts of the world that leads to throat cancer (Carcinogenicity of drinking coffee, mate, and very hot beverages). It is false to claim that to date executed studies on EHS prove lack of causality between EMF and EHS. These studies were performed by psychologists using EHS persons. These persons were afraid and concerned when participating in experiments they considered to be harmful to their health. This setting has certainly caused and additional stress that most likely interfered with experimental outcome of such studies. Fact that in the studies of small groups of EHS persons it was not proven that EHS person recognizes when is exposed to EMF is absolutely insufficient as a proof of non-existence of EHS. People cannot recognize when they are exposed to e.g. X rays or to ultraviolet radiation. The lack of the ability of human senses to detect (feel) low-level EMF exposure is not surprising. It is absolutely false, and scientifically naïve, to use such evidence as proof of non-existence of EHS. It is wrong to claim that person who does not feel EMF will not be affected by EMF. People are different and differently respond to environment. Some are e.g. allergic to pollen but the majority is not. To all known environmental stressors there is always known a small sub-group of persons who are more sensitive, including sensitivity to X-rays and ultraviolet radiation. Why EMF would be the one and the only environmental factor that would not have more sensitive sup-population of people? EHS persons certainly are among us. Problem is that, because the current science is inadequate, we do not know yet what level of radiation exposure triggers their symptoms. This can be found only by the future biochemical studies, not by to date executed psychological studies. Statement by Ala-Nissilä where he mentions one brain cancer per 100 million people, to say the risk is negligible, is simply a rubbish talk. The 100 million number has been plucked out of thin air by Ala-Nissilä. There is no science behind it. Just a “populist” rubbish. Currently, it is clear that cell phone radiation causes biological effects. What is still unclear is whether these biological effects, when repeated over tens of years, will lead to health effects or not. This is still unclear. Claiming, as Ala-Nissilä does, that the current lack of knowledge of biological mechanism that would explain these effects is very naïve. The biological effects occur and the mechanism will be discovered, sooner or later. Let’s remember that there are many biological phenomena where the mechanism is unknown. For example, we still do not know the biological mechanism causing glioma. This entry was posted in Mobile phones and health and tagged Aalto University, Ala-Nissilä, Alexander Lerchl, carcionogenicity, cell phone radiation, CERENAT, EHS, glioma, group 2B, group 3, hugging, human heat, IARC, Interphone, Lennart Hardell, microwaves, non-thermal, Professor of physics, Tapio Ala-Nissilä, thermal, Turun sanomat, Voi hyvin by dariuszleszczynski. Bookmark the permalink. I agree with Tom Whitney when he says that funding is going to studies with methodological flaws. What is happening is that many weakly-designed or flawed studies are being published due to inadequate scrutiny, even when peer-reviewed. These studies tend to show that there is no association between microwaves and cancer. These same studies are cited by authorities to show that mobile phones are safe. The weaknesses or flaws could include one or more of the following: inadequate sample size, poor exposure metrics, short-term exposure, highly specific endpoints, wrong interpretation of results, wrong handling of the data, conclusion not congruent with the results, exclusion of other radiation sources, etc… Unfortunately this is the state of many epidemiological studies on this important health hazard. When I describe studies as weakly-designed I am not always accusing the authors of shortcomings in their approach. It can also mean that many studies cannot be strongly designed due to the enormous difficulties to know the various factors and parameters involved in each particular study. Epidemiological studies on humans with regards to radiation are very complex and the more time passes the more they become, mainly due to the increasing different sources of microwaves all around us. Fortunately there are also well-designed and stronger studies that when compared to the rest show an association between microwaves and cancer. I can mention a few authors that have published such studies for example, Hardell, Soffritti, Lerchl among many others. And there is also the NTP study. It is for the above reasons that the science weighs in favour of the harmfulness of mobile phones and that due to this the precautionary principle must be invoked. Louis Gatt – This will be my final comment on this item. Firstly, there are no known CUMULATVE effects from non-ionizing exposures below regulatory limits. Secondly, what I am suggesting is that without accurate dosimetry, such studies are a waste of time and money. I am all for more studies, since we do not have all the answers. But, funding should not go to any studies which have severe methodological flaws – like poor dosimetry. Tom, I never said that poor dosimetry is a desirable feature. What I would like you to understand is that the dosimetry of epidemiological studies on humans with regards to microwave radiation is very difficult to establish. The reason for this is that it is difficult to know with reasonable accuracy the cumulative exposure of cases and of controls. If we take as an example cigarette smoking, you can know exactly the smoking habits of the cases and of the controls, and therefore have a relatively good measure of exposure. The human epidemiological studies that show a weak association between microwaves and diseases are to be appreciated for showing an association in spite of the limited exposure accuracy. It seems to me that you are suggesting that human epidemiological studies on mobile phone radiation are a waste of time and should not be conducted. I would disagree with you about this. Louis Gatt – What a bizarre conclusion! Case-control studies with no robust dosimetry have no predictive value, and should be considered uninformative. And, this is exactly how this methodological weakness has been repeatedly interpreted in numerous authoritative expert reviews. I cannot imagine how you could think that poor dosimetry is actually a desireable feature which adds to the strength of a scientific study. Studies without proper exposure assessment/dosimetry tell us nothing about the potential risk of adverse health effects. Tom, your comment helps to confirm what I said. The difficulties in getting good dosimetry data are causing studies to show no association between microwaves and disease. Many studies on this topic are weak due to this effect and tend to show no harmful effects. Those studies which, in spite of no robust dosimetry, show an association of disease with microwaves, are to be considered as an early-warning of epidemics to come. Also, re-think your position compared to the Bradford-Hill viewpoints. You are clearly on the wrong side of science – and common sense! Tom, your interpretation of epidemiological studies is not correct. The situation is that IN SPITE OF a lack of robust dosimetry, epidemiological studies are showing significant harmful effects. From the numerous studies, including those in labs, that show adverse biological effects of microwaves, the only thing that is highly implausible is the suggestion that mobile phones are harmless. I have found out 7 mistakes in interview with Professor Tapio Ala-Nissilä published in ‘Voi hyvin‘ journal. Only for field of microwaves! Nevertheless, you had better not say: “false”. None of what was said by Professor Tapio Ala-Nissilä is backed by scientific evidence. If he is quoting what other ‘experts’ said then he is a follower of pseudo-science. The issue of infra-red heating is very relevant to the argument because the professor said that humans emit 100 W of microwaves. Also, the main argument is not heating. Everybody agrees that excessive heating by microwaves is harmful to humans. The argument is the non-thermal adverse biological effects. Professor Tapio Ala-Nissilä is trying to give the impression that mobile phones have a ridiculously low risk to humans. He is wrong to give this opinion because there is considerable evidence from human and animal epidemiological studies that mobile phones are harmful. Risk analysis is not based on absolute risk but also on potential risk, that is, the risk that these epidemiological studies are eventually proved to be correct. Tom as always, thanks for the industry sponsored reviews from ICES. As retired scout for places to settle cell towers you know who are your bosses and where your allegiances. As you say: “Tapio’s comments include minor misstatements”. Since you do not specify what misstatements you have in mind, it is difficult to judge whether word ‘minor’ applies or not. But, regardless, this is as you say ‘crux of the problem’. Ala-Nissilä might be expert in physics but he is amateur and lay person in biological and health effects. This is the reason why some of his statements are nonsense opinions that I pointed out. Ala-Nissilä, professor of physics but amateur in bio-medicine is serving serving final judgements on health. This is wrong here. He should not. He is not ‘professor in everything’ and he makes ‘misstatements’ because of his lack of knowledge. “If epidemiological studies, showing increased risk of glioma, are correct…” is the crux of the question regarding the potential adverse health effects of RF emissions below regulatory limits. Since all the epidemiological studies you rely upon use an unreliable exposure proxy in place of actual exposures, there is no robust dosimetry data or dose response curve that would lead a multi-disciplinary panel of experts to conclude other than as Tapio Ala-Nissilä – and so many others have. Of course, slim possibilities of adverse health effects remain. But, the evidence is very weak – and the theoretical causal mechanisms that have so far been suggested are highly implausible. So, while Tapio’s comments include minor misstatements, his general point is right on target! I am surprised by your absolute certainty when you state: “How many does cell phone “radiation” kill? None.” Where from you know? Your statement is bogus as it is not supported by any evidence. If epidemiological studies, showing increased risk of glioma, are correct then, some people get brain cancer from exposures to cell phone radiation and die of it = die of cell phone radiation… It is rare but not impossible scenario. Everything I say in the feature is backed up by scientific evidence and other experts. DL is not. The peak in the human radiation spectrum is close to 10 microns, which is closer to the IR than microwave region, but this is totally irrelevant to the main argument: heating. In fact, the main point of the whole discussion is realistic risk analysis: what are the real factors that cause health risks to humans? Cell phone “radiation” is not among such risk factors. Even here on the northern hemisphere the Sun kills about 120 people a year. How many does cell phone “radiation” kill? None. The above statement is completely wrong. The IARC classification is based on the latest research at that time when it was issued in 2011. It is the ICNIRP guidelines which are based on research done in the 1990s. The guidelines were issued in 1998 and have not been updated yet. The ICNIRP is completely out of touch with reality and is still ignoring the experimental results that show its “theory of thermal effects only” is completely inadequate. The very small amounts of energy in the form of microwaves emitted naturally from human skin have a much higher frequency than that emitted by mobile phones (close to 300 GHz, while mobiles typically emit in the range 0.8 – 2.1 GHz). In fact, the high frequency microwaves emitted naturally from the skin are unable to penetrate the surface of the skin of a person close by. Professor Tapio Ala-Nissilä is either confused or he is trying to fool his audience. Professor Tapio Ala-Nissilä is talking about thermal effects only. It is often the case that some experts completely ignore the numerous studies showing experimental results which help to prove that there are significant non-thermal adverse effects in living biological matter. I regret to say that some physicists believe that humanity knows everything about the interaction of all the range of electromagnetic radiation and living matter. The reality is that we still have to discover and understand many of the complex mechanisms that are involved in the interaction with living cells. It seems to me that Professor Tapio Ala-Nissilä is failing to distinguish between microwave and infra-red radiation. The 100 Watt energy he is claiming to be emitted by humans is practically all in the infra-red range. Microwaves emitted by humans are extremely weak in energy and can hardly be detected. I completely agree with you on this and the said Professor T.A.N. is using ridiculous evidence warped and biased…who funds the guys research anyway? So many suffering from exposures and it is being denied and passed off as psychological. The only thing about it that is psychological is the effects of the denial of pain and suffering that one encounters in such a situation. Denying the pain and suffering and in some cases torture people feel upon exposure to anything–including wireless radiation–causes many psychological problems for people. When illness is denied–those who are suffering are not getting what is common for people to get when they are ill and which helps them cope such as: empathy, medical care, support, recognition, assistance….. The only psychological part of this is the mental anguish people experience when their reality is denied. That is actual a sort of mental abuse and those suffering illness that is not explainable yet all suffer this way. CFS, MCS, ME, Lyme, and EHS all fit into that category and all experience a severe marginalization of their suffering and needs and worth. It is a tragedy what is being done to those who are suffering. When you ‘blame the victim’ by insisting it it their own perceptions causing the biological pain–it destroys a person inside. It really is an extreme form of mental abuse. Thank you for clarifying this issue Dariusz.